An in-expensive solution for a headboard is to use a store bought screen. In Jackie's bedroom, a hand carved screen from Cost Plus World Market was the ideal backdrop for colorful bedding and pillows. Don't be afraid to play with texture and fabric when choosing accent pillows. Mixing shimmery silks and rich velvets with long-haired shaggy furs and nubby cotton canvas creates a visual feast and a wonderful tactile experience while relaxing in bed. Picking art for any space can be a challenge. The key is to embrace a color scheme and have fun with it! If you are drawn to vibrant colors and patterns, find art pieces that capture these elements. The canvas panels in Jackie's bedroom had a rich purple and silver finish and soft, organic shapes. Keeping the wall color bright but fairly neutral helped the artwork really pop. Painting an existing piece of furniture is a great way to blend it into a new room design. A simple fix like changing out the knobs on a drawer front or adding casters to its legs instantly changes the look. Flowers are essential in making a space feel lively. 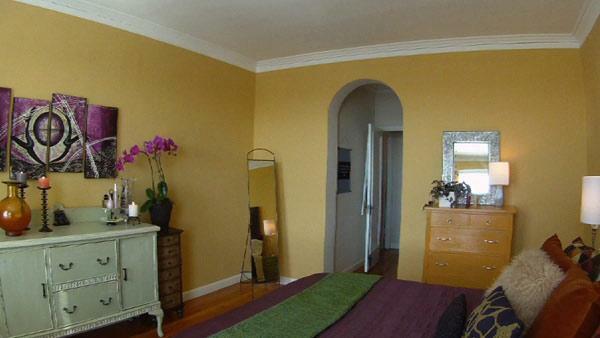 A beautiful orchid was the perfect way to brighten up the bedroom and incorporate Jackie's favorite color, purple. People may shy away from orchids because they seem difficult to maintain, but simple steps like keeping the leaves dry while watering and providing adequate light will prolong their life and make the blooms last longer. Buying canvas paintings from artists is a great way to get high quality artwork on a dime. Jackie had beautiful unframed canvas paintings she brought back with her from a trip to Thailand. Our budget didn't allow for custom frames to be made, but we were able to find a great video tutorial on how to stretch canvas online. With simple wood stripping from the hardware store and a mitor box and saw, we made simple frames that made a huge impact on the bedroom wall.